I think one of the things you need to be able to do is to define what uncertainty is. If you opt for volatility as a proxy for uncertainty then you see something quite interesting. The VIX which is known as the fear index and should reflect uncertainty is actually at sitting somewhere near its long term average, indicating that the players who make up this index don’t actually see any uncertainty and are not asking for an increase in the risk premium they demand. The same is true if you look at the historic volatility in the Dow which is also sitting at a 9 year low. From my perspective is the issue is not uncertainty in markets but uncertainty in decision making that is brought about by listening to external sources. If you switched off the news and all the associated commentary and simply looked at markets what would they tell you? Uncertainty is a situation which involves imperfect and/or unknown information. However, “uncertainty is an unintelligible expression without a straightforward description”. It arises in subtly different ways in a number of fields, including insurance, philosophy, physics, statistics, economics, finance, psychology, sociology, engineering, metrology, and information science. It applies to predictions of future events, to physical measurements that are already made, or to the unknown. Uncertainty arises in partially observable and/or stochastic environments, as well as due to ignorance and/or indolence. You will notice that the definition holds at its core the uncertainty inherent in predicting future events. In fact the science of probability is based around trying to deal with the fact that the universe is an uncertain place. 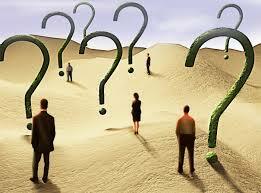 However, uncertainty is the default setting in trading – the outcome of all trades is unknown until they are closed. It is this uncertainty that gives us the potential to be profitable, investments that have known or certain outcomes have no risk premium attached as such they offer little in the way of return (think bank deposit). This definition is therefore of little use in unpacking the notion of a change in traders uncertainty quotient. Granted we can respond to changes in volatility and we have tools to measure this but this is a reasonably common occurrence in trading and there are strategies that can be put in place to deal with this. In fact very basic position sizing and volatility based stops self-correct to deal with this sort of problem. So I am drawn back to the idea that what actually changes is the tone and intensity of the narratives that people surround themselves with. This ever increasing crescendo of noise is bound to take an effect on peoples psyche particularity at present when the world appears to be spinning out of control. However, notice I used the expression appears, I used this term because appearances and reality are not the same thing. What brings some equilibrium back to the noise of others is as always context, the markets tell a completely different story. Whilst the breathless gibbering that is the media may consider the present to be the most troubled time in history and need to shout about it at every opportunity neither that markets nor history itself would agree. This is the most salient point for traders with regards to what is considered uncertainty. Uncertainty is the environment within which we operate as a broad observation but beyond that it is actually the markets themselves that define what actually uncertainty is and they can do this by readily accessible metrics. When volatility and in turn risk premiums increase then we can say that uncertainty has increased. However, even here people try inject their own primitive narrative into events as the VIX which is a widely known measure of volatility is referred to as the fear index when it is nothing of the sort. However, this is the natural human desire for drama, we all have a friend or relative who is addicted to drama and those in the news media, particularly the financial arena and prime diva’s. So if you find yourself believing that uncertainty has increased but markets don’t agree then you will need to do something about what leaks into your brain. Petrofac – and there’s a crash! Petrofac shares (LSE:PFC) have crashed seriously. Price consolidated in February and March this year, and then formed a bearish signal in April, and then collapsed massively in May. 4 EMAs are used for this analysis and they are EMAs 10, 20, 50 and 200. The color that stands for each EMA is shown at the top left part of the chart. The 4 EMAs are sloping downwards, signaling a strong bearish outlook. Since the market has gone below the EMA 200, there is a Death Cross in the market. Price is currently below the EMA 10: The bearish momentum is very strong. The crash on Petrofac is supposed to continue, though there could be temporary upward bounces along the way. Further losses are anticipated here, in 2017. Fusionex stock (LSE:FXI) has broken downwards, after several months of tight consolidation, which became a base. Some think price ought to break upwards from a base. Well, Fusionex broke downwards, forming a bearish signal. The market had been consolidating since last year; plus price has broken downwards recently, going below the lower Trendline. At the same time, the RSI period 14 has gone below the level 50. There is a bearish signal in the market. The GBP/USD moved sideways from Monday to Wednesday, and then began to come down on Thursday. Price went downwards from the distribution territory at 1.3000 towards the accumulation territory at 1.2800 (a drop of 200 pips). The outlook on GBP pairs is bearish for this week and for the month of June 2017. Though the markets are supposed to become quiet in June, GBP pairs would trend seriously. GBP/USD: The GBP/USD moved sideways from Monday to Wednesday, and then began to come down on Thursday. Price went downwards from the distribution territory at 1.3000 towards the accumulation territory at 1.2800 (a drop of 200 pips). The outlook on GBP pairs is bearish for this week and for the month of June 2017. Though the markets are supposed to become quiet in June, GBP pairs would trend seriously. This pair consolidated last week, moving between the resistance line at 1.1250 and the support line at 1.1150. The resistance line at 1.1250 was tested several times, but it could not be broken to the upside, owing to the ongoing consolidation. A breakout is anticipated before the end of the week, which would most probably favor bulls as the resistance line at 1.1250 is broken to the upside, but the outlook on the market is bearish for June 2017. It should be noted that certain EUR pairs may not go bearish in June. This pair went sideways last week, in the context of a downtrend. 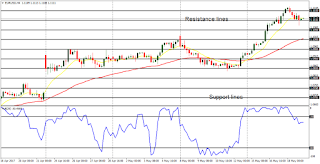 Price oscillated between the support level at 0.9700 and the resistance level at 0.9800. The support level at 0.9700 was tested several times and it could not be breached to the downside – and that is exactly what would happen this week – a breakout to the downside. This week, the Greenback would be weak while the Swissie would be strong: Hence further bearish movement in the market as the support level at 0.9700 is broken to the downside. This trend would reverse when EURUSD plummets in June. GBPUSD is bullish in the long-term, but bearish in the short-term. 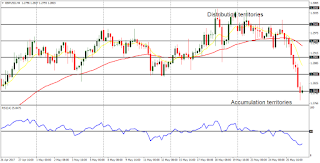 The market was caught in an equilibrium phase from Monday to Wednesday, and then went southward on Thursday and Friday, dropping 200 pips from the distribution territory at 1.3000 to the accumulation territory at 1.2800 (a well-anticipated occurrence). The outlook on GBP pairs is bearish for this week and for the month of June. Markets would generally be quiet in June, but GBP pairs would trend seriously, going bearish in most cases. The market is neutral in the long-term, but bearish in the short-term. There was no significant movement last week, but things could become significant before the end of this week. The demand level at 111.00 was tested many times last week, and without success. The most probable movement is southwards, as the demand levels at 111.00, 110.50 and 110.00 are breached to the downside. There was no significant movement on EURJPY last week, save price went slightly bearish on Friday, in the context of an uptrend. The markets would generally be quiet in June 2017, while JPY pairs trend seriously nonetheless (just like GBP pairs). The outlook on JPY pairs is bearish for June; plus the most probable direction is southwards. EUR/JPY would go downwards by at least, 300 pips within the next two weeks, and that would lead to the end of the current bullish bias. Hurricane Energy shares (LSE:HUR) have generated a new bearish signal. The bearish signal could become significant over time, resulting in a serious bearish trend. The price has been going upwards since July 2017, until recently. There is a now a movement below the EMA 21, while the Williams’ % Range period 20 is in the oversold territory. 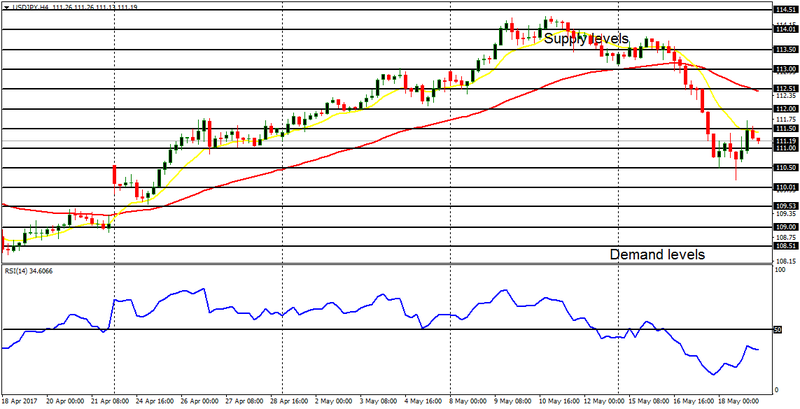 There is a bearish signal in the chart, which means price is expected to go further and further downwards very soon. Hurricane Energy is expected to go more and more southwards within the next several months. The accumulation territories at 50.00, 40.50 and 40.00 are the target for the bear. Stay away from Xtract Resources! Xtract resources stock (LSE:XTR) is a no-go area for those who invest logically. The price has just been going sideways for the past several month, and that has formed an extremely tight base. Although the ADX period 14 is above the level 80 (strong momentum), while the DM+ is above the DM- (bullish signal), the MACD, default parameters, is flat. The signal lines and histogram, are almost as flat as the zero line. That means the market should be disregarded until there is a rise in the momentum. On Xtract resources, price is flat, and the base is strong. However, there would soon be a rise in the momentum, which, according to the ADX, might favor the bull. 1. Wrong documents formats uploaded (we accept only JPEG and PDF formats). 2. Incomplete documents. We need your passport photo and any government-issued ID. If you send only one of these two, you cannot get verified. 3. Documents that have poor resolution or which are unclear. 4. You cannot respond to the Neteller account/email you registered because it’s not your email. 5. You entered fake or incorrect information (This would result in banning you from using our services). Those who haven’t been verified have been contacted and advised on what they need to do. 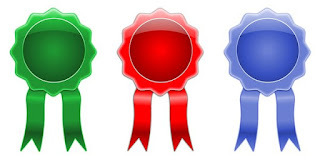 NB: The winners were chosen in the order in which they got verified, not in the other in which they registered. 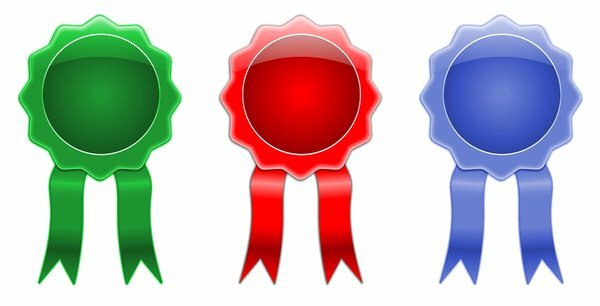 All the winners above were paid on Monday – May 22, 2017. We apologize to our winners who may be offended by the publication of some of their info. We just had to do it, and that’s why we didn’t reveal your full names, full Neteller accounts and we did not publicize your bank account numbers. The EUR/USD gained 290 pips last week, as price closed slightly above the support line at 1.1200. This week, price may target the resistance lines at 1.1250, 1.1300 and 1.1350. Some EUR pairs would trend higher, while some would trend lower this week. However, the EUR/USD is supposed to trend higher. EUR/USD: The EUR/USD gained 290 pips last week, as price closed slightly above the support line at 1.1200. This week, price may target the resistance lines at 1.1250, 1.1300 and 1.1350. Some EUR pairs would trend higher, while some would trend lower this week. However, the EUR/USD is supposed to trend higher. 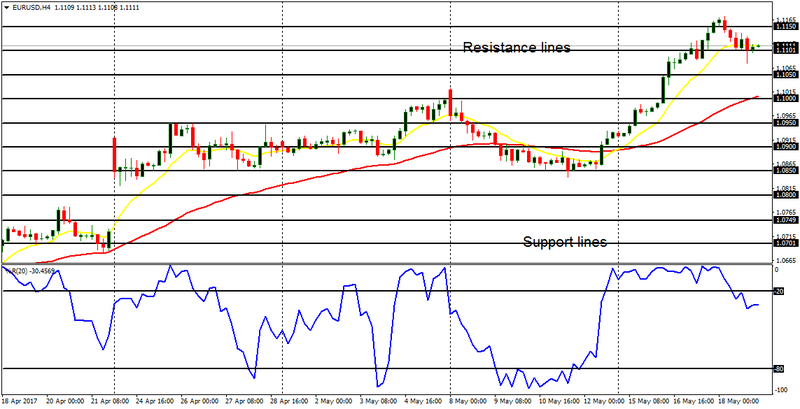 USD/CHF: This currency trading instrument lost 270 pips last week, closing below the resistance level at 0.9750. 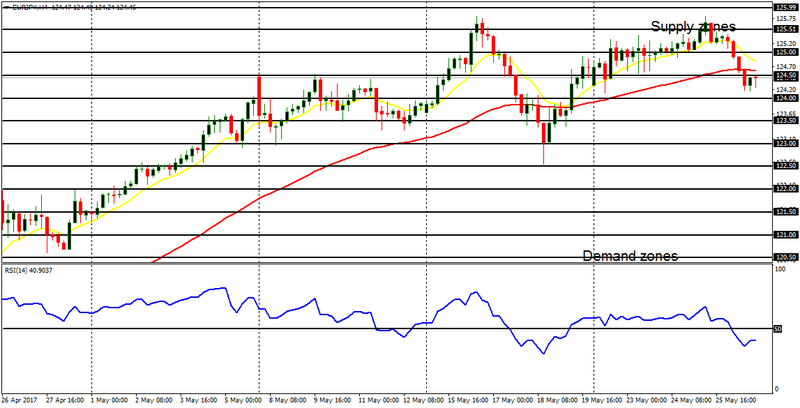 Price has lost 340 pips since May 12 – something that has resulted in a strong Bearish Confirmation Pattern in the market. 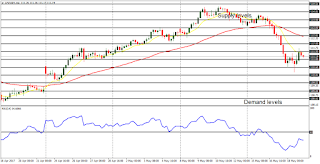 The outlook on the USD/CHF remains bearish for this week, and further southwards movement would be witnessed as the support levels at 0.9700, 0.9650 and 0.9600 are being tested. 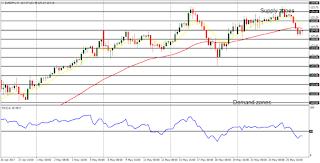 GBP/USD: This pair consolidated in the first few days of last week, and then trended upwards, to emphasize the recent bullish outlook on the market. 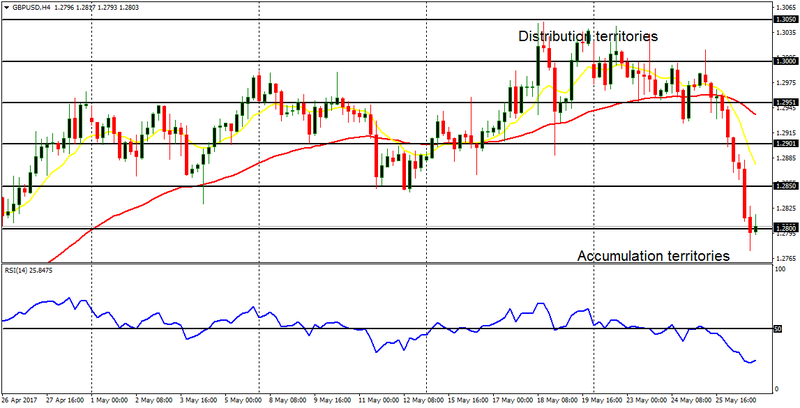 Price is now above the accumulation territory at 1.3000, going towards the distribution territory at 1.3050, which should be breached this week as price rallies more and more. USD/JPY: The USD/JPY experienced a major pullback last week. In the first few days of the week, price lost about 300 pips, before consolidating in the first few days of last week. There is a bearish outlook on the market, and it would continue to be logical as long as price does not go above the supply level at 114.00 (which would, however, require extraordinary buying pressure). EUR/JPY: This cross pair went upwards on Monday and Tuesday, came down on Wednesday and Thursday, and then went up again on Friday. Unlike its USD/JPY counterpart, the EUR/JPY cross has not gotten bearish, and one factor helping the situation is a measure of strength in the EUR itself. Price could gain additional 200 pips this week, especially when the Yen becomes weak. Go short on Jubilee Platinum!